Test automation is the activity to creating test script that can run with out human interventions on the same UI that the customer and end user would seen. These scripts can reduce the execution time and cover all the aspects of application. The first generation of test automation tools provided the macro recording facility which run on the synchronous API rather than UI. The test execution engine would fire a command, and then wait for the command to complete.A macro based tool was good for such short length automation, By combine a logical sequence of such short length macros, and your test flow is automated. The second generation of test automation tool provided full‐fledged scripting, or even objected oriented language support to the automation engineer. A lot of tool APIs were present to simplify the common windows based tasks like application launch, file operations, generating elementary test reports, etc. In a quest to achieve accelerated software delivery, organizations are increasingly adopting Agile development methodology. However, maximizing the benefits of Agile software development requires testing to be performed concurrently with development. Script-less is an approach to build an optimized test automation engine by empowering testing team to quickly build automated test cases by sequencing and ready but reusable code assets to ensure the full test coverage. Script-less means no scripting and programming in the test automation tools native language. it doesn’t means there are no scripting involved. This means while automating test cases there is no need to program scripts for each test case. Script-less testing serves to reduce the time required for creating automated tests by considerably reducing the amount of scripting needed and it is no way a substitute for actual coding of an organizational test automation tools. Script-less testing is highly flexible and conventional testing framework with minimal code exposure. Simple definition of script-less test automation is an approach that helps users automate their tests without having to script or code using any programming language.”Test automation is a software development process that demands core technical capabilities. Test automation, most often than not, is driven by automation experts who might not necessarily have enough functional expertise about application under test. All the good concepts of test automation like data driving, keyword driving and modularity are wrap in a very easy to use software package. All the requirement of test automation script like sequence of keyword, steps with in each keyword, data per step, sequence of keyword for the test and UI object definition are available in a very easy to use interface. Test automation will continue to deliver what it promises reduce repetitive testing efforts and accelerated regression testing. But going script-less will ensure you achieve these results much faster than promised by script based test automation. 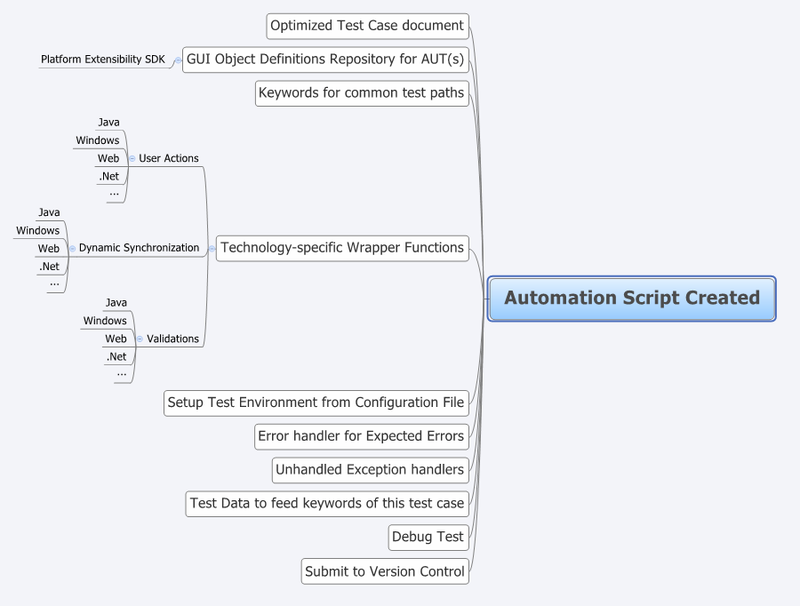 Script-less test automation strives to bridge the gap between functional and technical expertise by allowing functional experts to take the driver seat in test automation.Script-less experience is achieved by abstracting the technology layer by use of work-flow driven approach to build automated test cases along with a set of keyword that run in the background which convert work-flow into scripts. Requires one time effort of Automation Experts to define the architecture & design the solution, class libraries, custom keywords etc. Ability to keep up with increased product workload without increase in resources. Faster execution of automated tests. Increased test coverage as result to fewer product escapes. Script-less no different from record and playback – Record and playback is capability that users can choose to use to record their tests and play it back to execute them.The recorded scripts contains hard coded test data inputs, cannot handle dynamic situations and is more error prone since it does not perform any validation and error handling on its own. The recorded script does not work in long run as they are not maintainable, scalable, and reliable.Unlike record and playback, the script less approach also provides a flexibility to manage dynamic object and associate multiple data sets. Script-less means script-free – Script less automation is an experience made possible by building keywords that are reusable across applications, tools, technologies, platforms etc.The idea is to have our automation experts build a library of simple yet exhaustive keywords that can be easily used by functional experts, allowing them to quickly automate tests without any scripting.Keywords can be of different types like user actions such as “Click”, “Select Item”, “Enter Text”, etc and operations such as arithmetic, file, database, and many more. As far as a complete automation suite is concerned, it needs to grow organically from within your environment by carefully integrating business and operational logic step by step until it gets to a point where no further scripting is needed for people who are using it. Script-less test automation is not maintainable and reliable – Script-less test automation is a well-structured, methodical yet a very flexible approach to handle all types of complexities an application under test has to offer. It eliminates the complexities of test automation tools by building a layer on top, allowing functional users to automate.A well designed script-less approach, maintains complete traceability of all reusable components and maps dependencies throughout the test automation life cycle. Today there are several highly organized tools that offer script-less automation for use in multiple real time test scenarios. The developers of these tools have analysed numerous business cases, operational scenarios, deployment environments before building reusable components for their tools. They offer a high degree of practical reliability as well. With the evolution of artificial intelligence, big data analytics, and high speed cloud computing, we may in the near future have a taste of script-less testing literally but for now, it is safe to assume that script-less testing is a highly flexible and conventional testing framework with minimal code exposure to users.